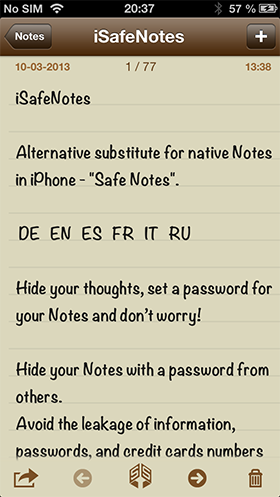 Alternative substitute for native Notes in iPhone - "Safe Notes". Hide your thoughts, set a password for your Notes and don’t worry! Hide your Notes with a password from others. Avoid the leakage of information, passwords, and credit cards numbers in case of loss of your cellphone. Record your notes, thoughts, and poems. 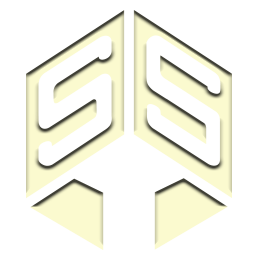 Share single notes with others. 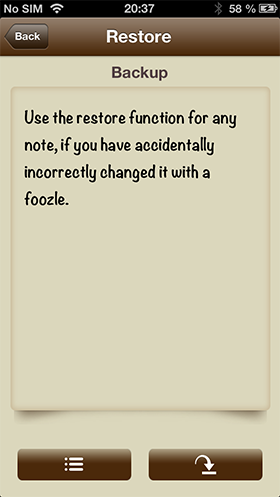 Use the restore function for any note, if you have accidentally incorrectly changed it with a foozle. Adjust the font size, type, themes colors, and sounds. 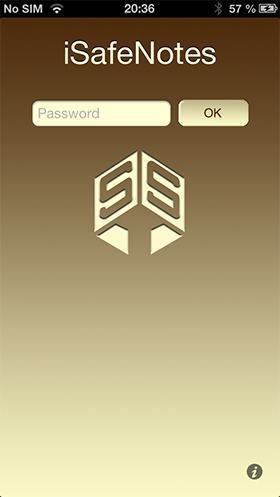 There are important and operational settings in the program, see the interface configuration in "Settings" section of the iPhone. Archive and restore all your notes at once with a help of a desktop computer. 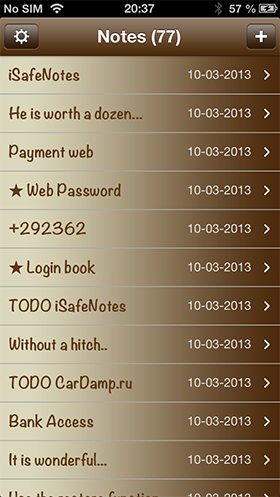 The function of double password is implemented in the notes. There is a main password and a master password. 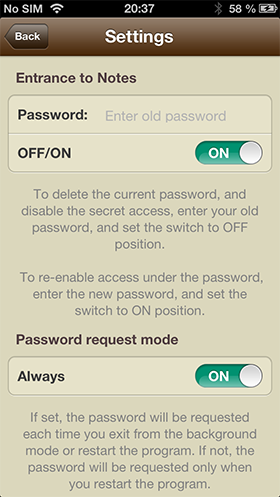 If you lose your password, you can reset the main password and restore the access with the help of Master Password. There is a function of fast and complete removal of all the notes from the device. When creating this program, I carefully approached the issue of design and functionality. The program was not only not to yield the native notes, but to exceed them in terms of functionality. For me, the main condition and impetus to create these notes e was the lack of native notes in the iPhone, the ability to set a password for the program and the ability to easily backup all your notes to your computer. I haven't found a perfect version among similar programs in AppStore, either free or paid. Everything is either very simple or rather nothing at all, nothing but imperfections or twists, so that you will not understand what that button means, without a glass. The ability to create folders/categories. Quick help is available at the address on Facebook, and at the end of this page. Send us your feedbacks and comments. Report on errors, and just take time to thank me, if you liked my program. Please, don’t forget to support me and evaluate iSafeNotes in AppStore and on Facebook! Заходим в iTunes, вкладка приложения. Внизу будет список приложений с общими файлами. Выбираете приложение iSafeNotes, справа появляется список файлов. Оттуда копируете файл с заметками к себе на рабочий стол компьютера. Это будет ваша резервная копия. После этого вы можете удалить iSafeNotes и установить заново с новым паролем, а потом файл заметок с рабочего стола перетянуть обратно в iSafeNotes. What's the guarantee that author-apps don't violate my secret notes? Comment on the program of notes iSafeNotes. Express your wishes for the future version of the program. You may also ask your question here and get technical support.